Growing up is hard work, and a child has a special set of requirements to get the job done. “Kids have to be treated as their own entities with unique needs,. That’s because your little person is still developing, of course, from her brain to her bones. Here are a few ways on how you can give him or her what it takes to get big and strong. Take folic acid and avoid drinking alcohol to help prevent certain birth defects and disabilities. Know your family’s health history to see if you and your baby are at higher risk for certain diseases and conditions. Make sure any health conditions you have are under control and that you are up-to-date on your vaccinations. Read more here; Healthy pregnancy tips. As your kids grow, they should reach milestones in how they play, learn, speak, and act. A delay in any of these areas could be a sign of a developmental problem. The earlier you recognize a delay, the more you can do to help your kids reach their full potential. Routine check-ups help identify ways to stay healthy and help find health problems early when chances for treatment are better. Vaccinations help prevent many diseases and save lives. Keep track of your and your family’s checkups and vaccinations to make sure they stay current. Read more here; Preventive health-care. Take steps to make sure your home, car, school, and other areas are safe. Use car seats and seat belts for appropriate ages and sizes. Keep harmful substances and objects out of children’s reach. Be aware of signs of maltreatment, including physical, sexual, or emotional abuse. Ask a trusted friend or family member to watch your kids if you feel yourself losing control and need a break. 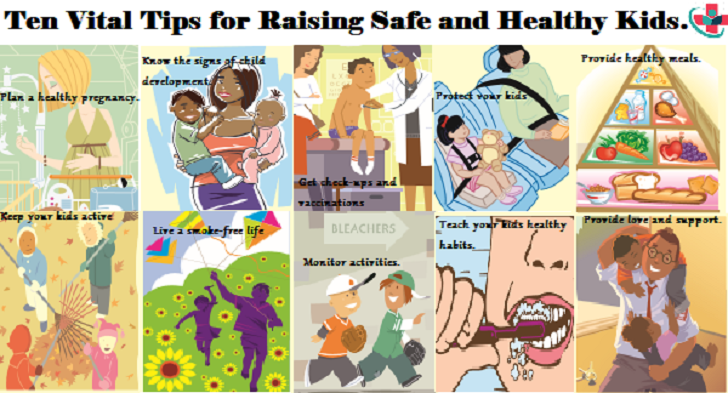 Read more here: Guide to keeping your baby safe. Eating right will help provide the nutrients needed to have energy, build strong bones, and fight diseases and conditions. For babies, breastfeeding is best. As children grow, help them choose healthy meals and snacks. Pay attention to what and how much they eat. You’ll help them stay on track and may uncover problems of which you were unaware. Read more here; Guide to healthy eating. also, Healthy breakfast is essential for kids. Help kids and teens to be active for at least one hour a day. Include activities that raise their breathing and heart rates and that strengthen their muscles and bones. Find fun, safe, and active things you can do with your kids to help keep the whole family healthy. Read more here; Physical activity guide. Being exposed to second-hand smoke is just as harmful as smoking directly. Be smoke-free during pregnancy to prevent premature birth and other health problems. Stay smoke-free to help lower your children’s risk for sudden infant death syndrome (SIDS), bronchitis, asthma, and pneumonia. Read more here; Health benefits if you stop smoking. Kids learn from family, friends, media, school, and more. Know who they spend time with, what they are doing, and whether their activities are age-appropriate. Know how their schools promote health and safety. Help your kids develop skills to make safe and healthy choices every day. These include fastening seat belts, wearing helmets, applying sunscreen, brushing teeth, washing hands, forming healthy relationships, and more. Make safe and healthy choices every day to show kids how to do it. Read more here; How to reinforce positive dietary. Kids need the support and love of family and friends. Talk to your kids to help them understand how they can be healthy, safe, and happy. Find out what’s going on with them and how they are making decisions and handling problems. Respond to their physical and emotional needs. It’s important for kids to develop in a safe, loving, and secure environment. Read more here; How fathers care contributes to child's health.